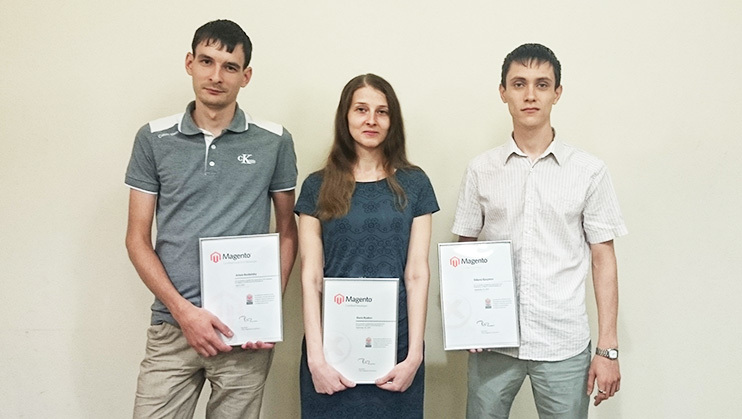 Congratulations to our developers with the Magento certification! We grow and develop and we vitally require the constant perfection. That’s why more and more of our specialists pass the certification and come to the new level. We congratulate our developers Eldaniz Gasymov and Ilya Demidov with the certification Magento Developer Plus. This is the top degree of the “mastership acknowledgement” confirming the extended knowledge of the Magento Enterprise platform. We also congratulate Anna Karpova with the certification Magento Development. Certificate Magento Developer confirms the in-depth knowledge of the Magento platform. We note that all certification programs were elaborated by the joint efforts of the Magento/eBay representatives and the Magento Community developers, which is the guarantee of effectiveness and objectivity of appraisal of our specialists’ knowledge. Currently we are the leaders in the number of the Magento certified programmers in Russia. Today our team numbers 9 certified developers. Acquired expertise allows us to guarantee 100% quality of the development, implementation, testing and maintenance of the projects irrespective of the complexity level of the created solutions. Our team doesn’t plan to stop at the achieved goals; we wish success to our guys and everybody who is permanently aimed to the self-development and the new achievements.